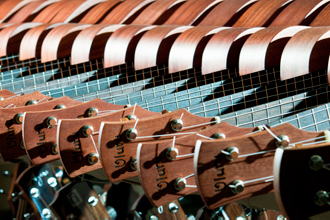 With pure love and craze for the unique sounds, Ayers presents the ultimate ukulele line, Uluru. Made by the best Hawaiian Koa and decent exotic tone woods, along with the luthier shop skills, Uluru soon gets its reputation in handmade ukuleles. For the past decade, Ayers made high quality ukuleles in our custom shop and provide them to some ukulele franchised stores in Japan and Europe only. The handmade quality and unique sounds soon attracts ukulele players and we decided to share our passion to the world.